Hybridge Treatment Protocols have been developed with safety and efficiency in mind. By establishing rigorous standards and techniques, the practice of implant dentistry is brought to a new level. A patient-centered approach ensures that ideal treatment outcomes are achieved in a swift, efficient manner. When both the number of appointments and the number of weeks to complete each treatment are shortened through greater efficiency, the cost of Hybridge tooth replacement can be as affordable as possible for each of our patients. If the teeth to be replaced need to be removed, their extraction may be able to be completed at the same time as the dental implant placement. This "one-stage" protocol can be followed when the tooth to be replaced has a single root and is not infected. Molars have at least two roots and usually require a "two-phase" treatment sequence. The two-phase sequence requires that the remaining roots are removed first and bone filled (grafted). The bone graft is allowed to heal for up to 12 weeks before the implant is surgically inserted in the second phase. Hybridge Treatment Protocols differ between the upper and the lower jaw due to their significant anatomic differences. 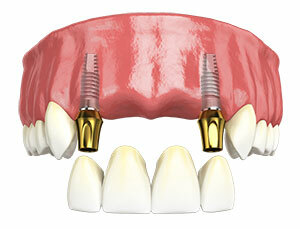 Whether it is the upper or the lower jaw, two dental implants canreplace up to five or six missing teeth. By definition, a "bridge" connects two supports (abutments). With an implant on each side of the area of missing teeth, the Hybridge Multiple Tooth Bridge is cemented or screwed onto the implant abutments, replacing as many teeth as needed. Front teeth are required to tear food so that it can be chewed on the back teeth. A Hybridge Multiple Tooth Bridge that replaced front teeth must provide both strength and beautiful esthetics. The latest ceramic materials in the industry are utilized at the Hybridge Laboratory. Zirconia and Lithium Di-Silicate are ceramics that have been shown to have very high strength and fracture resistance as well as the ability to replicate the natural beauty of tooth enamel. A temporary Hybridge is always made so that during the process, at no time will there appear to be teeth missing.